Planned junction improvement works for Felpham this month have been branded a ‘total waste of money’ by Observer readers. According to the West Sussex County Council, a new mini roundabout is to be built to help drivers exit a side road at the Summerley Lane/Felpham Way junction. Read more here. A county council spokesman said this junction was identified as ‘needing improvement’ by Felpham county councillor Hilary Flynn and the parish council. 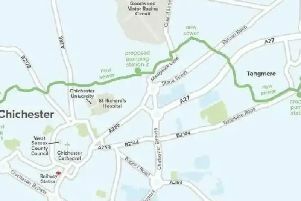 However, a number of Observer readers have asked why the works, which the county council claim will cost about £140k, are not being made at ‘death trap’ Comet Corner or the Oyster Catcher junctions. Commenting on our Facebook page, Ann Hulston wrote: “[It is a] total waste of money and will only cause traffic holdups. Similarly, Tracy Merrett asked: “Is it really needed there now? Thought the new road would have improved things. Claire Gettings said a roundabout is more needed at Comets Corner, because it is an ‘utter death trap’. Coral Beed said the Summerley Lane/Felpham Way junction ‘hasn’t been a problem since the new road opened’. James Ware said both the Comet Corner and Oyster Catcher junctions ‘deserve to be higher up the priority list’.